As my first term at Dame Tipping comes to an end, I would like to say a big thank you to all the children, staff, governors and parents who have made me feel so welcome. It has been a real pleasure getting to know the school community. We’ve had a very exciting week this week and have had lots of fun getting into the Christmas spirit. A group of KS2 pupils sang at St Francis’ Hospice, which was very well received. KS1 and Reception put on 3 wonderful performances of ‘Hey, Ewe!’ for the school and for parents. Thank you to all of the staff and children who put in lots of effort to make the show so special. We also had our Christmas lunch whilst wearing our festive jumpers. The whole term will be rounded off with a special service at St John the Evangelist church. 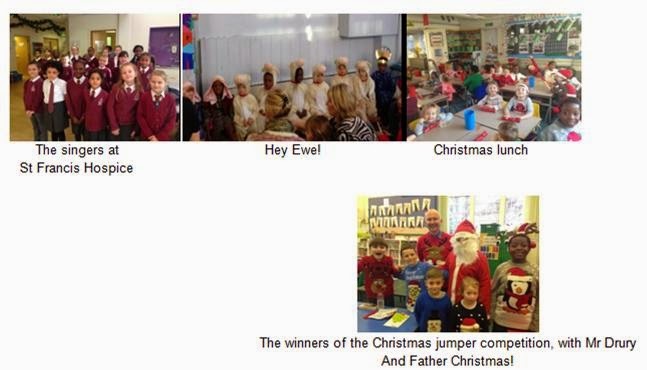 The winners of the Christmas jumper competition, with Mr Drury and Father Christmas! Thank you so much for all the Christmas cards and gifts. It was very kind of you to think of me. This week’s award goes to Freddie French for living up to our school motto and having a positive impact on his class and the school. Congratulations to Maansi Chagger for earning her place in the Gold Book for excellent classroom behaviour. On behalf of all of us at Dame Tipping, I would like to say goodbye to Charlotte McCormack, who is leaving for another school today. We wish you every happiness in the future. Well done again to Class 4 (Reception) for having 100% attendance again this week. You are stars! Please note: there will be no clubs in the first week of term. You will receive information about next term’s clubs in the first week back. From January, we will be providing a facility where, should you so wish, we can issue your child’s dinner ticket to them from the office each day. This should prevent dinner tickets from going missing. We have lots and lots of school jumpers and other items (many unnamed) in the tub outside Mrs McCormack’s room. Please could you look through and take home any which belong to your child on the first day back. Thank you. I would like to end by wishing you and your families a happy and peaceful Christmas.